Jen Beagin’s brilliant, off-beat and deeply moving novel introduces an unforgettable character, Mona - almost twenty-four, emotionally adrift and cleaning houses to get by. Volunteering for a needle-exchange programme, she falls for a regular she calls Mr Disgusting, who proceeds to break her heart in unimaginable ways. In search of healing, Mona decamps to Taos, New Mexico, for a fresh start, where she finds a community of seekers and cast-offs, all of whom have one or two things to teach her - the pyjama-wearing, blissed-out New Agers, the slightly creepy client with peculiar tastes in controlled substances, the psychic who might really be psychic. But always lurking just beneath the surface are her memories of growing up in a chaotic, destructive family from which she’s trying to disentangle herself, and the crushing legacy of the past she left behind. Pretend I’m Dead is a stunning debut novel; its cover is filled with recommendations from established authors, and it tops my best reads for 2018. Jen Beagin has created a wonderful character in Mona, a self-described ‘cleaning lady’ who adores vintage vacuum cleaners and performs wonders with a bottle of Windex. When we meet Mona she is nearly twenty-four, has recently dropped out of college, and ceased both medication and therapy. Taking her self-destructive tendencies to a new level, Mona begins a relationship with a man she meets while volunteering with a needle exchange program. Privately she calls him ‘Mr Disgusting’ due to his dirty and dishevelled appearance, but she is devastated when he breaks up with her and relapses. On a whim Mona moves to New Mexico and starts her own cleaning business. She encounters off-beat characters, such as her Zen-like next-door neighbours who want to help her achieve greater stability, and Betty the psychic who employs Mona twice a week to clean and to spy on her ex-husband. Mona takes all this in her stride, and still pursues her photography passion by using her cleaning clients' homes as background for her unusual self-portraits. 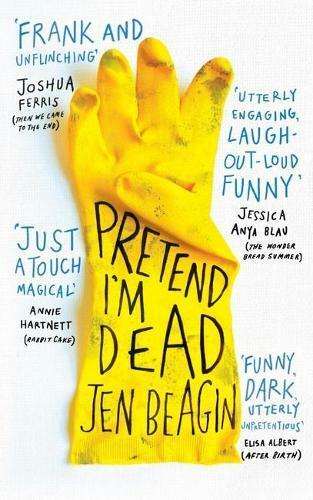 Pretend I’m Dead is an entertaining read, yet it is also extremely touching. Threaded through the novel is the story of Mona’s childhood, before she was ‘shipped off’ to her father’s cousin, Sheila, at age twelve. Through Mona’s narrative, and occasional phone calls with her father, we learn subtly of the rejection and trauma she suffered. However, this trauma is managed with a light touch and the book can also be viewed as a belated ‘coming of age’ novel. I recommend this book for readers who like quirky and unusual characters (think Otessa Moshfegh’s Eileen), and I was delighted to read that Beagin is working on a sequel.